Regular readers of Balladeer’s Blog are familiar with my fondness for Movie Host shows of the past and my EXCLUSIVE interview with Randy Clower of the mid-1980s program The Texas 27 Film Vault has proven to be a very popular item on this blog. Randy and his cohost Richard Malmos, playing machine gun- packing Film Vault Technicians First Class, would show and mock bad and campy films from decades ago and were a huge hit when they were on the air. I feel they get neglected in this age of renewed interest in older Movie Host programs. The poster also sports features from some of the most popular bad movies Randy and Richard dissected on the program – features like flying brains from the movie Fiend Without A Face, a prop from the Bela Lugosi bomb Devil Bat, Hitler’s disembodied head from the enjoyably awful movie They Saved Hitler’s Brain, an invader from Earth vs the Flying Saucers and much more! 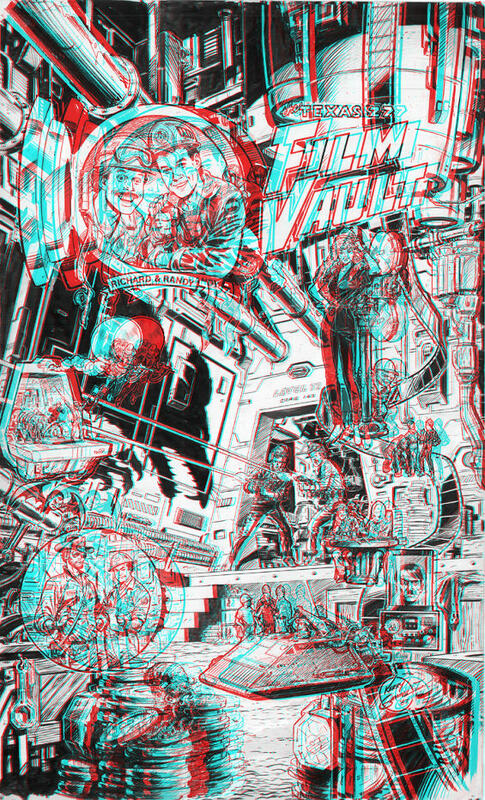 Put on your 3D glasses and you can spot all of the hidden items including elements from Gorilla at Large, Just Imagine, Frontier Marshal, the 1961 film The Mask and other T27FV fan favorites. Note here on this 3D poster are Randy, Richard, Ken “Tex” Miller, Joe Riley, Laurie Savino, Greg Bransom and some of their fellow members of the fictional Film Vault Corps – “the few … the proud … the sarcastic”. In addition the pic features other bits of Texas 27 Film Vault Trivia like gigantic predatory rats and celluloid- eating cellumites, just two of the sci-fi menaces that the Film Vault Corps protected “America’s Schlock Culture Heritage” from. The little guy in a Film Vault Corps uniform is a Drone, a friendly subterranean species the FVC came into contact with.